I bought the cutest little pumpkins and gourds the other day at the farmers market. There's one of the pumpkins in the picture above. I need to take some more photographs with my gourds. 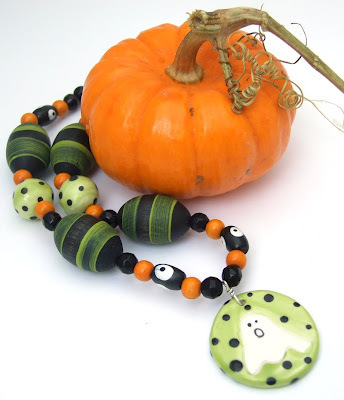 The Halloween necklace went out in my monthly newsletter yesterday. You can always sign up here if you didn't get it. I am a sucker for art supplies and I can justify any purchase to myself. I always "need" the right tools. You know how that goes....well I decided that I absolutely needed a set of Copic markers. I have been doing some drawings lately with sharpies and I like them but the colors are limited. I started doing some research and came across Copic. At the same time I happened to be reading "Where Women Create", (love that mag!) anyway, Mary Engelbreit said she loved her Copics. Well, there you go....I was sold. So I sucked it up and bought them. They are expensive, but once again they are for art. I drew out my name in my new fancy markers and decided that would be my new signature on my blog. What do you think? Maybe at the holidays I will change it up and make it Christmas-sy.